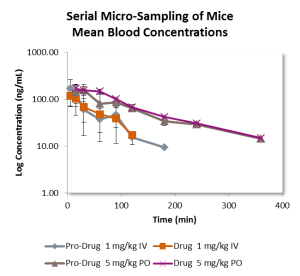 The mechanism of clearance is the single most important piece of information a pre-clinical drug development program can obtain on its compounds. Knowing how a compound clears from the body gives insight into dosing regimen and into potential liabilities such as low bioavailability, drug-drug interactions, and accumulation. Mixtures of compounds dosed to a single animal. Reduce animal use, increase throughput, reduce cost.